The second suite derived from Bizet's incidental music for L'Arlésienne opens with a Pastorale, originally the prelude to Act 2 of the play, and the most complete bit of music Bizet had composed for L'Arlesienne that he hadn't already used in the first suite. This broad Andante evokes the rolling Provençal countryside with a simple theme subjected to several treatments and interspersed with gentle, rustic woodwind passages. 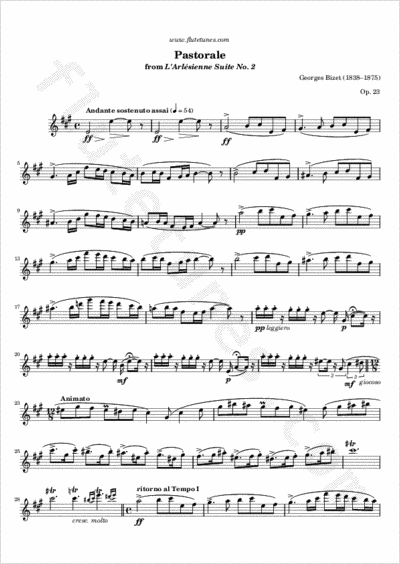 The middle Andantino notably features the flute and the piccolo as the solo instruments. Choosing a tempo is not an easy task here. Most editions of the incidental music and of the suite indicate quarter = 54, so this was probably originally marked by Bizet himself. Nonetheless, today the piece is commonly played much faster, at about 80 beats per minute.